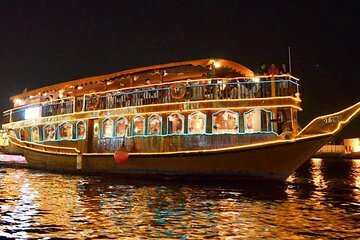 Climb aboard a tradition dhow boat in Dubai for a lovely dinner cruise along the creek. Admire the twinkling Dubai skyline as you tuck into a delicious buffet of international and local cuisines accompanied by non-alcoholic drinks. Enjoy ambient music of Arabic and English songs while cruising as well as free wifi on board. Hotel pickup and drop-off in Dubai is included.